Smoking cessation (quitting smoking) is one of the best things we can do to protect our bodies from disease, fight illness, undergo treatment, and help our bodies heal. Research shows that 70% of people who smoke want to quit 1 and that 41% of smokers have tried to quit for at least one day in the past year. There are many reasons why people want to quit smoking and better health is often at the top of the list.2 Unfortunately, many people who actively smoke have had many quit attempts that were unsuccessful; this can be discouraging and it can prevent people from trying to quit again. It can be difficult to know how to approach quitting smoking, find the support you need, and be successful in quitting for good. The content in this chapter will give you the key information you need to understand how nicotine dependence occurs, what happens when you stop nicotine, how to avoid the unpleasant symptoms of nicotine withdrawal, and most importantly, how to quit smoking safely and effectively. When a cigarette is smoked, the chemicals and nicotine contained in the cigarette are combusted at high temperatures, into gases and inhaled into the lungs. These substances quickly travel from the lungs into the arterial blood and the left side of the heart. The left side of the heart moves chemical containing blood out to the body and straight to the brain. The transfer of nicotine, from the time a puff is inhaled from a cigarette to the time it is delivered to the brain, occurs quickly, within ten to twenty seconds. The more cigarettes smoked, the more circulating nicotine is present and attaches to the nicotinic acetylcholine receptors. This results in higher dopamine levels in the brain. Nicotine begins losing its stimulating effects soon after it is inhaled and is gone within two hours. When the nicotine is metabolized and disappears in the body/brain, the receptors are empty, the dopamine levels drop, and the receptors start begging for more nicotine; this is when withdrawal symptoms kick in and there is an urge to smoke. Common symptoms of withdrawal include anxiety, irritability, agitation, and a drop in mood or even depression. People also experience disturbance in their sleep, difficulty with concentration, changes in bowel function, increased appetite, and urges to smoke.4 These symptoms are unpleasant and, if not prevented or treated, will cause a very strong urge to smoke again. Replenishing nicotine by having just one cigarette will ease or eliminate these symptoms and this is why people often go back to smoking, because it makes the symptoms of withdrawal go away, almost instantly. When quitting smoking, staying away from cigarettes is the most important part of both short-term and long-term success in staying quit. There are methods of quitting smoking that are proven to minimize and even prevent the unpleasant and detrimental symptoms of withdrawal from nicotine. The most important thing to remember when using nicotine replacement therapy is to be sure to get enough nicotine replacement; if not used properly, it will not work for you. Often people feel that the patch, gum, or lozenge did not work for them and this is usually because they were not getting enough replacement of nicotine to prevent symptoms of withdrawal. Getting enough nicotine with a combination of the long-acting patch and a short-acting method will make quitting smoking much easier and provide a smoother transition off cigarettes. The patch should be changed every 24 hours. It is recommended to use the initial patch dose for one full month and then step down the patch doses every 2-4 weeks until off the lowest dose. In this example, you would use a patch for a total of 8-12 weeks (2-3 months) after you quit smoking; this ensures a smooth landing in getting off nicotine safely and effectively. You should know that this is longer than many people think they need to use patches. Remember, the key is to be successful in the long run, so wean off as slowly as needed; there is no rush! The patch is formulated as a long-acting medication. For safe, effective, and continual delivery of the medication; the patch should NOT be cut. Similar to cigarettes, the nicotine in the patch is stimulating and can cause active or vivid dreaming and/or wakefulness at bedtime. Unless you are accustomed to smoking in the middle of the night, it is recommended to take the patch off an hour before bedtime to avoid disruption of sleep. Start a new patch as soon as you wake up the next morning. Remember that it takes at least an hour for the nicotine in the new patch to deliver a steady state of nicotine in the blood stream so, it’s important to use a short acting nicotine replacement, in combination with the patch, for urges to smoke, as discussed next. Nicotine replacement is available in several forms of short-acting delivery methods. These short-acting doses of nicotine are very important in the success of using nicotine replacement therapy in quitting smoking. Even if you use the transdermal patch for continuous nicotine replacement, you may have urges to smoke and withdrawal symptoms. Think of short acting nicotine replacement as your quick acting, rescue, medication. Treating these cravings with one of the following four options of nicotine replacement, in combination with the long-acting patch, is one of the most effective ways to avoid lapsing or relapsing with a cigarette and returning to regular patterns of smoking. The gum is available in 2mg and 4mg doses. It is important to know that the gum only works if it is absorbed through the mucosal lining of your mouth (between your gum and your cheek). The best way to use the gum is to chew it until there is a peppery/spicy, tingly sensation, then park it between the gum and cheek for 5 minutes. Then chew it again until there is another sensation (about a minute) and park it for 5 minutes. Continue about five cycles (approximately 30 minutes) of this chew for 1 minute and park for 5 minutes, in order to get all the dose of nicotine the gum has to offer. The chewing for a minute is necessary to activate more nicotine in the gum so you may then park it for optimal absorption. It is safe to chew up to 20 pieces of gum a day for breakthrough cravings and withdrawal symptoms. 6, 8, 9 Gum is not effective when wearing dentures but can be chewed and effective if the dentures are out of the mouth. This product is available over the counter for purchase. Many insurance companies are now covering this when prescribed by a medical provider. The lozenge is similar to the nicotine gum. It is available in 2mg and 4mg doses and, like the nicotine gum, the lozenge needs to be tucked between the gum lining of the mouth and cheek to be absorbed. The standard starting dose is the 2mg lozenge, which delivers the equivalent of nicotine in one cigarette. Avoid acidic foods or beverages right before use and when a lozenge is in the mouth.6, 8, 9 This product is available for purchase over the counter. Many insurance companies are covering this when prescribed by a medical provider. The nasal spray contains nicotine that is delivered through the mucosal wall/tissue of the nose. When using it, it is important to tip the head back slightly and spray it against the nasal wall but do NOT sniff it deep into the sinuses. One spray in each nostril (2 sprays) delivers a similar dose of one cigarette.6, 8, 9 This product is available only by prescription. It is normal for this spray to cause a warm sensation in the nostrils. The nicotine inhaler is a popular method of short-acting nicotine delivery for people who have a strong attachment to the ritual of holding and handling a cigarette. Although this is called an “inhaler”, the nicotine delivery is taken in by puffing on the inhaler, not taking a deep inhalation, or “drag”, as would be done with a cigarette. The nicotine is absorbed through the mucosal tissue of the mouth so it is important to only inhale or puff the medication into the mouth (not the lungs) for optimal absorption; 20 puffs = the amount of nicotine in one cigarette. This product is available only by prescription6, 8, 9 and is different from an eCigarette, which is discussed later in this chapter. Your pharmacist can teach you how to load and use the inhaler. This product is not effective if dentures are in place. It is possible to be taking too much nicotine replacement. Symptoms that could be associated with taking too much nicotine are: feeling anxious, jittery, headache, nausea, excessive wakefulness, and chest pain or heart palpitations. If you develop these symptoms or any others that you think are associated with nicotine delivery, stop using all nicotine products, including taking the patch off and call your medical provider for further advice, as soon as possible. Remember to avoid smoking cigarettes while using the nicotine replacement therapy to reduce the chances of overdosing on nicotine and provide the best opportunity to quit. Bupropion SR is a long acting prescription medication that is commonly used to help people quit smoking. It has shown to double the success rates in quitting smoking and works well with the nicotine replacement therapies. It is also known as “Zyban” and “Wellbutrin”. Some people are hesitant to take this medication because they have heard that it is used for depression and do not want to take an “antidepressant”. It is true; bupropion is used for depression because it allows more of the neurotransmitters, dopamine and norepinephrine, to circulate in the brain. Remember that nicotine drives the dopamine levels up and this is why the brain experiences a mood elevation when smoking. When the dopamine levels drop with the withdrawal of nicotine, the brain can experience agitation, anxiety, and depressive mood changes. Bupropion helps in transitioning off cigarettes/nicotine because it allows more dopamine to circulate and protects the brain from an abrupt withdrawal off the dopamine. It reduces the craving for cigarettes, helps with the anxiety of quitting smoking, and often suppresses appetite and controls weight gain associated with quitting smoking.4-6, 9 Talk to your health care provider to determine if bupropion is the right medication for you. Varenicline is a prescription medication that is commonly used to help people quit smoking. Varenicline has shown an increased success rate in quitting smoking of up to four fold.9 It is also known as “Chantix”. This medication works by attaching to the nicotinic acetylcholine receptors in the brain and causes the same release of dopamine that nicotine does. This medication mimics the presence and action of nicotine and tricks the brain into thinking it has nicotine on board. 4-6, 9Because of the way this medication mimics the presence of nicotine and attaches to the nicotinic acetylcholine receptors in the brain, in most cases, you would not benefit from using nicotine replacement therapies; Varenicline is typically used alone. This medication reduces the craving for nicotine and reduces withdrawal symptoms. Some people are hesitant to take this medication because they have heard of potential side effects including nausea, vivid dreams, or mood changes. Talk to your health care provider to determine if Varenicline is the right medication for you. Always take these medications with food to avoid nausea. If you are taking these medications twice a day, be sure to take the second dose closer to dinner time to avoid disruption of sleep and vivid dreams. Like nicotine from cigarettes, Varenicline stimulates the central nervous system and because of this action, it is more activating than sedating; taking it with dinner is ideal. Sometimes a dose adjustment needs to be made in order to tolerate the medication and optimize your opportunity to quit smoking. Wellbutrin is also more activating then sedating. If you experience agitation or even anxiety that does not go away, it might mean you need to reduce the dose of the medication or even stop it. Cutting back on the dose may reduce these symptoms and allow you to benefit from its action in helping you quit. If you experience any unpleasant symptoms, while trying to quit smoking, including disturbing thoughts or changes in your mood, you should stop the medication immediately and call your medical provider. Nicotine replacement therapy and non-nicotine medication therapies clearly show effectiveness in helping people quit smoking, long-term. There is also strong scientific evidence that shows formal counseling sessions added to either nicotine replacement therapy or non-nicotine medication therapy greatly enhances the sustained success rates of quitting smoking. The more counseling sessions that a person is involved with, the higher the success rate.6 The counseling could simply be talking to someone in your health care provider’s office. There are many alternative approaches and treatments to help quit smoking. People use these therapies for added control of withdrawal symptoms. Some of the more common methods are acupuncture, hypnosis, and herbal preparations. These approaches have not been widely studied. Currently, research does not show these methods are effective in long-term success in quitting smoking. However, many people have success using them, especially when combined with other evidence-based therapies, as discussed in this chapter. There are web-based smoking cessation resources on the internet. These online resources provide support and quit coaching options. There is not a lot of existing evidence that these resources are highly effective when used as the only approach to quitting smoking. However, using them in combination with nicotine replacement and/or non-nicotine therapy likely has a much greater chance of success in quitting smoking. The following are just a few examples of current available resources. There are telephone-quit lines available in most states. The services they offer vary depending on the funding for that program, and most provide telephone counseling by trained quit coaches plus follow-up telephone calls. The counselors are trained in coaching people in their quit attempt. They will provide educational resources and many will mail nicotine replacement therapy, including the long-acting nicotine patch and either the gum or lozenge, free of charge. With a prescription, some are also able to offer medications like Bupropion (Zyban) and Varenicline (Chantix) at a reduced cost. The quit line specific to any state in the U.S. or any of the Canadian provinces can be located by calling the North American Quitline Consortium (NAQC) at 1-800-QUIT-NOW or by visiting their website at www.naquitline.org . You can also find out about local resources through your local public health department or by searching online using your specific state or city and “quit smoking” as keywords. Many employers, especially large employers, have contracts with a professional quit line service that employees, and even family members of employees, can benefit from. The services and resources they provide are similar to the public quit lines. Call your employer’s Human Resources department to see if they provide this benefit. Support groups are often available through local community centers, medical centers, hospitals, public health departments, and local chapters of the American Lung Association and American Heart Association. Someone trained in tobacco cessation counseling usually runs these groups. The support groups can be a good way to connect with other people who are working on quitting or have quit, gather tips and ideas about how to quit successfully, and find much needed support when trying to quit and staying quit for good. When quitting smoking it is common to experience a lapse in the quit attempt. A lapse is when a single or a few cigarettes are smoked. A relapse is when regular smoking is resumed and lasts longer than seven days. It often occurs when people encounter strong triggers for smoking including stressful situations or events. 4 This can also occur if treatment is not effective or stopped too soon. Lapses and relapses are sometimes part of the road to success in quitting long-term.6 When a lapse or relapse occurs, people often feel bad about this disruption in the success of their quit attempt. In either case, it is possible to successfully resume the quit attempt. This can be done by returning to the approaches and methods that helped quit in the first place. Avoid negative talk to yourself or others who have had a lapse or relapse and remember to avoid triggers and focus on previous success and the goal of quitting for good. Reaching out to your medical provider and reviewing your treatment plan can also be helpful in case a dose adjustment is needed to optimize your opportunity for success. When quitting smoking, it is important to address your lifestyle rituals, and behaviors that are associated with smoking; this will help you transition to smoke-free living. Make a list of activities, people, or things that trigger the urge to have a cigarette. Be aware of these triggers and, if possible, make a plan to avoid them by restructuring your daily routines and developing new rituals that give you a break and provide pleasure, without smoking. Develop a list of activities that you can do instead of smoking; this should include activities to keep your hands busy. When you experience an urge to smoke, focusing on one or more of these activities can help you get through the craving and avoid having a cigarette. Tell people close to you or those you encounter frequently that you are quitting smoking; this will help them support you, in your efforts. 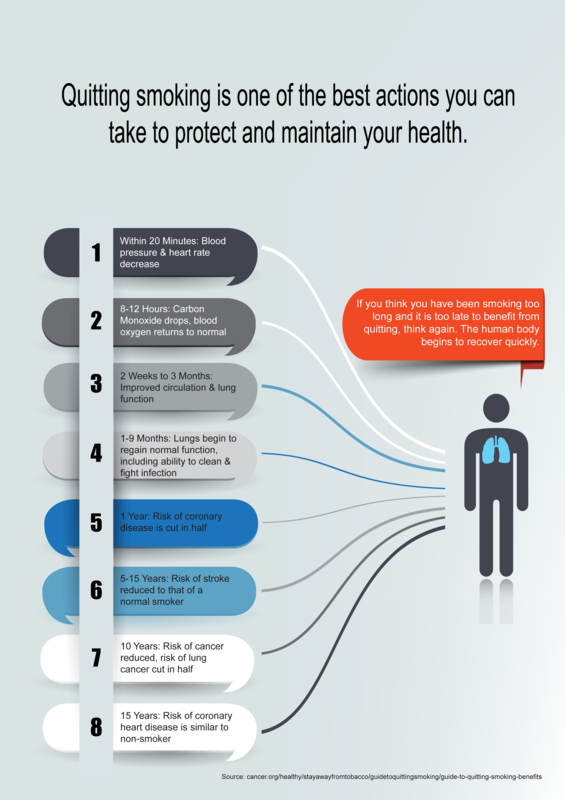 Quitting smoking is one of the best actions you can take to protect and maintain your health. In a time of illness, quitting will help your body prepare for medical treatment, improve your chances for optimal response to treatment, and enhance your ability to heal following surgery.14 Regardless of how long you have smoked, quitting smoking has immediate and long term health benefits; it is never too late to quit. 4 It can be difficult to quit, but with the right tools and knowledge about the best and most effective approaches to quitting smoking, quitting successfully with confidence, is a more realistic and obtainable goal. 2000. Am J Public Health. 2007;97(8):1503-9. Malden, MA: Blackwell Pub. ; 2006.
an overview and network meta-analysis. Cochrane database of systematic reviews. 2013;5:CD009329. Update: Public Health Service; 2008.
therapy for smoking cessation. Cochrane database of systematic reviews. 2012;11:CD000146. 9. Burke MV, Ebbert JO, Hays JT. Treatment of tobacco dependence. Mayo Clin Proc. for smoking cessation: a randomised controlled trial. Lancet. 2013;382(9905):1629-37. Crit Care Med. 2014;190(6):611-8. Epub 2014/07/10. 14. de Hoyos A, Southard C, DeCamp MM. Perioperative smoking cessation. Thoracic surgery clinics.